From 4-21 July, pioneering artists from over a whopping 20 countries are coming together to gift us both their UK and world premieres of their latest works. From world renowned musicians, to cult artists to legendary filmmakers, Manchester International Festival is a celebration of all the wonderful work of the worldwide creative community. Whilst most of the work is created for the festival, the artists will provide a snapshot of modern life, adventures into identity and language, the power of technology and what the future holds. Here’s some of the countless features that we can’t wait to sink our teeth into. The siren of peace Yoko Ono is set to open the festival in typical Yoko fashion with her artwork BELLS FOR PEACE, which encourages a mass participation from the crowd to sing their hearts out for peace. If Yoko isn’t enough to get hearts racing, iconic film guru David Lynch commandeers HOME theatre for the entire festival (not that we’re complaining), with his largest UK exhibition to date My Head is Disconnected. The exhibition is an eclectic mix of film screenings, visual art and Lynch-inspired gigs. Joining Lynch and Ono is national hero Maxine Peake, who is collaborating with theatre director Sarah Frankcom for an immersive piece exploring the sound and identity of the luminary Velvet Underground singer Nico in The Nico Project.We are excited to see whether Peake can further unravel the great mysticism of the singer. Speaking of national heroes, suave all-rounder Idris Elba (I mean, what can’t the man do) is another collaborator, working with artistic director Kwame Kwei-Armah on Tree, a comprehensive journey into the soul and spirit of contemporary South Africa. This project is also extremely dynamic, blending music, drama and dance together throughout the process. Elba excels at practically everything he does so we’re in safe hands. Grime sensation Skepta also graces us with his presence, to gift us more than just any ordinary set. In DYSTOPIA987,he promises to take us beyond the music to a futuristic take on the history of rave culture at a secret location in Manchester. Intriguingly vague. A triple threat collaboration by director Leo Warner, choreographer Sidi Labri Cherkaoui and touring dance company Rambert will present an adaptation of 1972 novel Invisible Cities. A captivating visual performance adapted by Cherkaoui, which if the novel is anything to go by, will reprogram our imaginations and what we view inconceivable. For all the greedy people who still aren’t satisfied, juggernaut composer Philip Glass teams up yet again with actor and director Phelim McDermott for their most personal collaboration to date. Tao of Glass vows to be a meditation on life, death and wisdom, which we cannot wait to sample. Marking the 200thanniversary of the Peterloo Massacre, the festival welcomes the premiere of a two-part commission, with various performances from composer Emily Howard, the three Halle choirs, poet Michael Symmons Roberts and the BBC Philharmonic. A rare introspective look into a historical landmark personal to Manchester’s own history and a chance to reflect this outwards to a wider community. A final mention goes to American singer Janelle Monae, who alongside Abida Parveen and Chrysta Bell, heads an all-female line-up of electronic artists heading the festival’s music programme. Curated by the excellent Mary Anne Hobbs. By no means have we covered everything the festival has to offer, but this taster alone should be the necessary ammunition needed to snap some tickets up. MIF19 will be, in a time of division and alienation, a welcome opportunity to come together to laugh, dance, cry, learn and maybe love too. 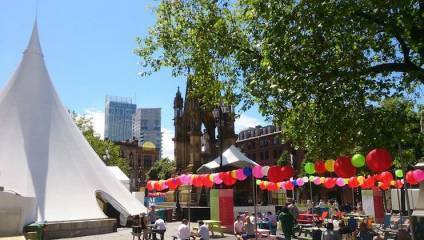 The festival is held accross a wealth of venues in Manchester, and tickets are available here.